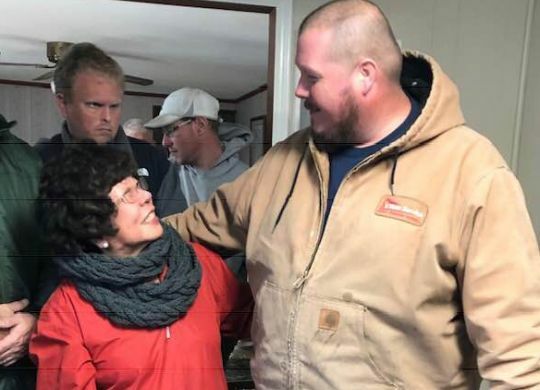 Photo: The Fuller Center Disaster ReBuilders’ Aaron Ratliff with homeowner Norika Nakada at the Jan. 10 dedication of her repaired home. Long-term recovery after a natural disaster is extremely difficult, and the work often is exacerbated by the lack of attention in the months and years as other disasters make headlines. It is in the trenches of this struggle that the Fuller Center Disaster ReBuilders work to rebuild homes, rebuild lives and rebuild hope for those in danger of losing it. The dedication happened while teams of volunteers from Orchard Park (N.Y.) Presbyterian Church and Auburn (Ala.) United Methodist Church were in town working with the Disaster ReBuilders. This is fitting because the two churches worked together with the Disaster ReBuilders last year on the Texas coast, where the Disaster ReBuilders maintain a current base of operations. That doesn’t mean, though, that anything is slowing down in the Houston area. If anything, work there may still be increasing. While volunteers’ positive experiences working with the Disaster ReBuilders in Texas means they can find plenty of eager hands to serve in North Carolina, that track record of success in Texas also helped them set up shop very quickly in New Bern. The work in New Bern has been a little different from that in Texas, mainly because of a dearth of funding. Ratliff added that there is a severe housing shortage in the area, so much of the grant money has gone to making critical repairs to get people back in their homes as soon as possible even if they are not 100 percent ready. New Bern is a beautiful community of about 30,000 people with a rich colonial history and close proximity to the Carolina coast, making it a popular tourist destination. In a way, that has complicated recovery efforts as some officials work to paint New Bern in the best possible light, glossing over the struggling families and damaged homes. Ratliff suggested striking a balance between tourism and recovery efforts. “The people who vacation here are the kind of people who can help,” she said.